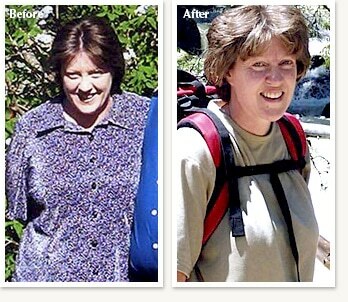 My name is Margaret and I started the transformation on January 29, 2007. My husband, Ed also started the same day. A friend of ours that we worked with had her Christmas party in December 2006 and we hadn’t seen her for a while. She looked great. She tried to give her ski jacket to Ed because it was too big for her. It was too small. He started talking to her about the program she was on and she gave glowing reports. She sent the information to him the following week. We both went online and registered for the program. Then we went on vacation. In January we returned and started talking about the Clinical Nutrition Center again. I had been told the previous year that I had high blood pressure and high cholesterol. My doctor put me on niacin and I took it for a while and got my numbers down a little. The niacin made me sick a couple of times and I quit taking it. I also had a hard time playing with the children at Christmas. Just getting up off of the floor was hard for me. I needed to do something. Ed called and set up an appointment for the end of January. We attended our first meeting together. I started off at 227 lbs. The meeting was good. We discussed how the program worked and the key points to being successful: sticking to the food program, writing down everything I ate or drank, exercising and finding out what factors cause people to stumble. My next appointment was the physical and meeting with Dr. Lazarus. He was a great source of information and assured me that the program and the appetite suppressant were both safe for the long term. He also said I only needed to lose 5% of my weight to get my blood pressure, cholesterol and glucose levels in a better range. This seemed more manageable to work at in chunks. I decided to start with the Nutrifast for the first 2 weeks to get me jump-started and focused. So for the first 2 weeks I only had protein packets. At work it was easy because I purged my desk of every other kind of food and I ate at my desk so I wouldn’t be tempted by food in the break room. The first few days I didn’t have a lot of energy so I didn’t start exercising until week 3. In the second week I felt a lot better. I had extra energy and was into the eating routine. Lisa Ininns is the Dietician that I met with weekly. She gave me great pointers and the weekly reading material to keep me focused. She also reviewed my food logs to make sure I was keeping on track. After the second week I moved to the Modified Fast. I still ate the same during the day and then had a salad at night. My meals usually consisted of maple oatmeal for breakfast, chicken soup with bouillon for the morning snack, a chocolate premix shake for lunch, hot chocolate for my second snack and chicken or beef on lettuce with cheese for dinner. In the evening sometimes I would have a dill pickle to get more sodium or a cheese stick. Occasionally I would have chocolate pudding. Ed and I started walking every night after work. It gave us time to discuss our days and also get some exercise. On the weekends we would go hiking. We would take a small cooler with shakes, cheese sticks and lunchmeat in the car so we wouldn’t be tempted to stop somewhere to eat. It was important for me to have the same routine for food so I didn’t stray. Also I knew in the mornings what to pack for work. The protein packets were easy and convenient. I kept some in my desk at work, some in my car and some at home. I kept my weekly appointments with Lisa and that kept me on track. I would remind myself when I wanted to eat something I shouldn’t that I had to weigh in on Wednesday. By Easter at the beginning of April I had lost 30 lbs. I felt great and people were always stopping me at work and asking if I was losing weight and what I was doing. We took our first trip to see family at Easter and everyone told me I looked good. I went to the used clothes store to buy work pants because I didn’t want to buy new clothes yet. I wasn’t finished losing yet! Ed and I were still walking every day and I also was walking a couple of miles at lunch time on work days. I continued on the Modified Fast. I had a lot of energy and didn’t need as much sleep. I woke up earlier and didn’t have to drag myself to work. In the middle of April we went on a Hawaiian cruise for our 20th anniversary. This was more of a challenge for the food part. I took some protein bars and some protein packets. The rest of the time I just tried to make good decisions. I stayed away from breads and rolls but allowed myself to eat the fruit. The pineapple, mango, grapes and melons were very fresh and tasted wonderful! We walked and swam everyday and took the tours of the islands. I had a lot of energy and wanted to be on the go all the time. The fruit didn’t waylay me too bad as when I returned for my appointment the next week I had still lost 3 lbs. In May we went to San Francisco for a work conference. I took the protein packets, the premixes and the bars along. Most days I was able to keep to the Modified Fast by doing packets during the day and having a salad at dinner. We walked to the conference and back every day and toured a little in the evenings. In June my Sisters and I went on a hiking trip for a week to Arkansas. We tried to hike at least 3 miles every day and then sightsee, swim or shop the rest of the day. Meals were more of a challenge since they had to accommodate everyone. We cooked at the cabin and my sister only brought recipes that were low in calories and fat. I stuck to the packets about half of the time. The rest of the time I ate the meals that were cooked and stayed away from anything that was carb-loaded. Six months and 67 pounds after I started the program, at the end of July, I had reached my goal weight of 160. I have purged my closet of all the size 22 and 2X clothes and actually splurged and bought some new clothes. I started on the Maintenance program in August after I had my follow-up counseling with Heather. I kept meeting with Lisa weekly until October because I wasn’t sure I could stay focused on my own. It is the end of December and I am maintaining. I have gained a few pounds back with Holiday parties and dinners but I have been able to make conscious decisions. No more grazing all day on Thanksgiving or mindless eating while watching TV. It has been an exciting journey. I still love it when someone comes up to me and says, “You look so good!” or “how much have you lost?” I feel much better. My health has improved tremendously; no high blood pressure, no high cholesterol and no border-line diabetes. The Modified Fast program was easy for me because I could only eat what I had. Maintenance has proved a bit more difficult. I tend to do worse the week after my appointment and then I am more rigid the week before the next appointment. I am still seeing Lisa every other week until I can become consistent. reign you in when there are temptations. Have a buddy. Ed and I are able to keep each other out of trouble and we encourage each other to exercise. Keep a food log. Even if you eat the same thing every day, like I did at first, it can get monotonous. The food log helps you to recognize what are good choices. Repetition just engraves it in your mind. Knowing that the Dietician will review the log may make you think twice before making a bad decision.